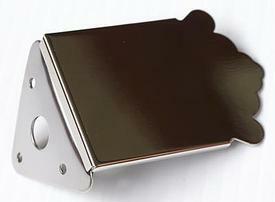 The Tyler Mountain MT10 Mandolin Tailpiece has a Steel Base and Removable Cover and is Nickel-Plated. Use as a replacement or upgrade to your Mandolin. Comes with mounting screws. Tyler Mountain Quality Parts.